There was fun at the council that week with the mystery of a missing memo and it led to a major investigation along with calls for tough action to be taken against the officers responsible. The missing memo had led to an overspend of £244,000 on a decorating scheme and was described as 'bungling ineptitude' which, said councillors, had to be punished and for action to be taken against those responsible and not the painters and decorators facing redundancy. The missing memo was sent by the Borough Treasurer to the Housing Department but no one could recollect having seen it and the original copy could not be found. Councillor Marcus Johnstone said: "This is just bungling ineptitude but it is always the case that it is the manual workers whose jobs are threatened. This time we have to get it right and the people responsible have to take the rap." Those painters and decorators whose jobs were threatened were ready to take action and they staged a demonstration outside the Town Hall enlisting support. Bungling at the council? Whatever next! Meanwhile the court case continued following the alleged shootings and racial tension in Holbeck Street. The court were told how a man was blinded in his left eye and another man peppered with bullets from a shotgun as the situation deteriorated. It had kicked off when those at a party at number 21 spilled out onto the street shouting racial abuse at those in number 28 where a white woman lived with an Asian man. Over in Rosegrove there was a fire in the stables at Halstead Farm causing £1,000 worth of damage. Things could have been much worse but for the actions of farmer's son Cameron Collinge who went in several times to rescue the horses, at some considerable personal risk. The fire had been started by intruders and farmer Gerald Collinge said: "The people responsible are either sick or very stupid." The alarm was raised by Cameron's dog and Gerald added: "If the dog had not managed to waken Cameron and his wife Christine, the horses would have all perished." One Burnley man had started to enjoy making phone calls, but, as it turned out, all to the same number. The 34-year-old started ringing the same woman. The calls were obscene and it didn't come to an end until he'd made eighty of these calls. In court he pleaded guilty to sending grossly offensive messages by telephone, contrary to the Telecommunications Act of 1984. He was fined £200 with £100 compensation and £25 costs. The court heard that the woman had become very distressed over a period of over 18 months and it only came to an end after the man was arrested through the use of British Telecom tracing facilities. The man accepted being responsible for the calls and said: "It was probably a case of trying to get cheap thrills and it got out of hand." He apologised for the distress he'd caused. It wasn't all bad news, in fact there was some fantastic news in Reedley when they finally got a bus shelter, and in a position where the buses stopped. It had been an ongoing problem for bus users and eventually, a few weeks earlier, they had got their shelter. The only problem was that it was placed where buses no longer stopped because drivers considered it too dangerous because there were no yellow lines. Eventually, to everyone's delight, the shelter was moved to a stop that the buses did actually use. Buses or not, Burnley were top of the league going into their home game against Lincoln City. Jimmy Mullen had been able to name what was probably his full strength side, the same team that had beaten Scarborough in midweek in the Autoglass Trophy. Adrian Randall was back on the bench having been unavailable and the Clarets went into the game against a Lincoln City side who had won 5-1 at Doncaster at the end of November and had since scored just two goals in nine league games. We'd beaten them 3-0 at Sincil Bank in October and were looking to complete what would be our fourth double having already taken maximum points from Aldershot, Doncaster Rovers and Chesterfield. The performance maybe didn't reach the heights of some in recent weeks but it was still good enough to win the points in a game we dominated with Chris Pearce having little to occupy him other than two first half saves. We weren't able to create the chances quite so easily in this game but we were fully deserving of the points from a game where the entire team worked hard throughout. It was never free flowing, had long scrappy spells, but Burnley were still able to have seven efforts on target whilst having little work to do defensively. Lincoln's two best efforts came in the first thirteen minutes of the game. 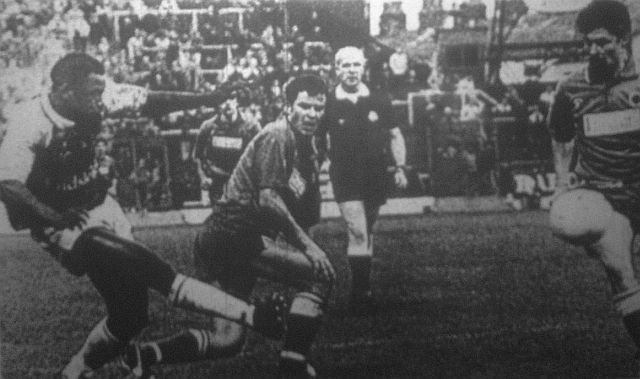 Pearce raced from his line to deny David Puttnam with only four minutes gone and nine minutes later he produced a fingertip save to tip a 30-yarder from Matt Carmichael over the bar. 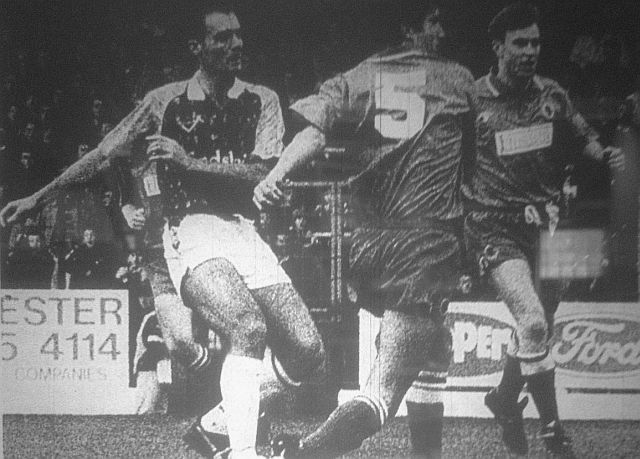 In reply, both Steve Davis and Roger Eli shot straight at Ian Bowling and then Davis came close to breaking the deadlock with a header following a free kick for a foul on John Francis. As the first half progressed we got more and more on top and eventually, right at the end of the half, we took the lead. John Deary started it with a great ball out to Francis down the right wing. Francis used his pace to get past David Clarke and he delivered the inch perfect pass for Mike CONROY to slide home. Burnley continued to dominate throughout the second half without being able to increase the lead although there should have been a penalty. Andy Farrell hit a great ball to Conroy who controlled the ball first time and then looped in a cross for Graham Lancashire. Lancashire was on for the injured Roger Eli and he looked a certain scorer only to be upended but the referee waved away the claims. In the end we had to settle for a 1-0 win and whilst it hadn't been much of a spectacle it certainly pleased manager Mullen, who said: "What people have got to accept is that when you're in the position we're in, top of the division and more than half way through the season, pressure builds up throughout the club. "That goes for the players, the coaching staff, the managing staff, the office staff, the whole lot. They all want the club to succeed. "The most important thing about the situation we find ourselves in at the moment is winning games. Nobody would like to see Burnley playing the most attractive football ever seen in the Fourth Division more than I would. "But remember, the fans have seen seven years of pretty, pretty football and the club has got nowhere. I have said right from the beginning that I would try to do the right things to get this club out of the Fourth Division. "I understand the frustrations of the fans and everyone in the town and I know that Burnley Football Club is steeped in the very finest footballing traditions, but what is in my mind is doing what's right to get us out of this division. "Today's result was a typical example of the fact that clubs come here and make things very, very difficult for us. We have got to scrimp, scrape and scrap for every little bit. We did that today, got the break and got the result. "I'm not saying that what we're trying to do at this moment in time will get us into the First Division, all I'm saying is that I'm trying to do the right things to get us out of the Fourth Division, then we can change and plan for another season." 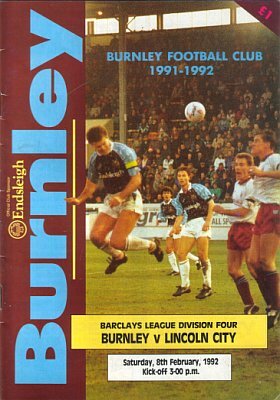 Burnley: Chris Pearce, Ian Measham, Joe Jakub, Steve Davis, John Pender, Andy Farrell, Steve Harper, John Deary, John Francis, Mike Conroy, Roger Eli (Graham Lancashire 72). Sub not used: Adrian Randall. Lincoln City: Ian Bowling, Smith, David Clarke, Shane Nicholson, Matt Carmichael (Gary West 85), Grant Brown, John Schofield, Paul Ward, Jason Lee (Dean West 75), Tony Lormor, David Puttnam. There was a name on the Lincoln team sheet who was to become much better known to Burnley fans later in the decade, that of Dean West who came on as a substitute for Jason Lee with a quarter of an hour remaining. West, at the time, was 19 years of age and there was another player who was to make an impact at Turf Moor some years later, just a year older than West at 20, who had an impact that day. Burnley's lead at the top of the league was extended to five points because Mansfield Town, who started the day in second place, were beaten 3-1 at home to Scunthorpe United. Ian Hamilton and Jason White scored for Scunthorpe but the all important first goal was scored by Graham Alexander. That defeat saw them drop to fourth, behind both Barnet and Blackpool on goal difference. There were five different scorers for Barnet in their win at home to Scarborough while Andy Garner scored Blackpool's goal in their draw at Wrexham. Burnley had another game to come in midweek, this time against Northampton Town. We'd won 2-1 at the County Ground in November with two Conroy goals on what was the occasion of Andy Marriott's last Burnley game. Northampton were the form team and were unbeaten in their last nine games, stretching back to Burnley's win there. Could we beat them again, do the double over them and end their unbeaten run?